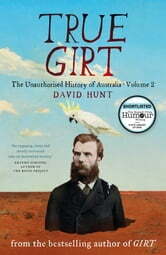 In this side-splitting sequel to his best-selling history, David Hunt transports us to the Australian frontier. True Girt introduces Thomas Davey, the hard-drinking Tasmanian governor who invented the Blow My Skull cocktail, and Captain Moonlite, Australia’s most notorious LGBTI bushranger. Meet William Nicholson, the Melbourne hipster who gave Australia the steam-powered coffee roaster and the world the secret ballot. And say hello to Harry, the first camel used in Australian exploration, who shot dead his owner, the adventurer John Horrocks. Learn how Truganini’s death inspired the Martian invasion of Earth. Discover the role of Hall and Oates in the Myall Creek Massacre. And be reminded why you should never ever smoke with the Wild Colonial Boy and Mad Dan Morgan. David Hunt is an unusually tall and handsome man who likes writing his own biographical notes. 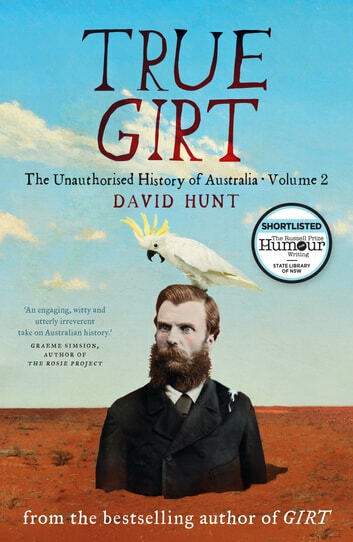 His first book, Girt, won the 2014 Indie Award for non-fiction and was shortlisted for the NSW Premier’s Literary Awards and Australian Book Industry Awards. He has a birthmark that looks like Tasmania, only smaller and not as far south. Absolutely loved it just as cutting as the first. I so hope their is more coming. Loved the caustic comments. Really an enjoyable read, but a little more subjective than Girt. Pity as it could have been less political and still achieved its goal. Can't wait for Girt 3 though. Girt was great. True Girt is truly t'riffic. Again we have a book about our history that should be a required read. Like much of history, I am historic before I read it. Entertaining and insightful, reading history has never been so engrossing! Excellent and enjoyable read. Every Kiwi must read. Get to know your cousins in Aussie.